I spent some time over the weekend and last night working on attempt #2 at the Windmills and Trees pattern by Lynne from Lily's Quilts and I have finished the top. You will recall that my first attempt was not successful (or go here to read about it). I love this version which is about 40" x 48". So my first thought was to use a blanket stitch - the stitch I would use if I was hand sewing an applique. And look, it turned out just as it should. I was worried about puckering and drawing in but the sticky stuff I used - Heat and Bond Lite - added enough stabilizer that it looks great, especially after pressing. Not content to leave well enough alone, I also tried another stitch that exists on the little sewing machine I have out on the coast. I am not sure what this one is called but you can see it on the tree part. It is easier to see here. I like this one and it causes even less drawing in but the edge will probably fray just a little more than the blanket stitch. Especially since I have to admit to not following the directions and overheating the sticky stuff so it did not stick perfectly well. I am planning a lot of quilting to ensure it all holds together. Another lesson - read the directions of any new equipment first. This project has been a true learning experience for me. The colours are fairly true in that picture - the grass here gets sort of brownish in the hot summer months. The quilt is made from various light and darker grey fabrics and bright prints by Kaffe Fassetts, Brandon Mably, and Philip Jacobs. Now I have to make the back and get on with the quilting. 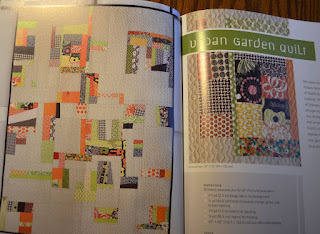 I don't have a big enough single piece of fabric with me for the back so tonight my thought is to do something like that photo above, which is from a wonderful book called Quilting Modern by Jacquie Gering and Katie Pederson. It looks like fun and will hopefully complement the forest on the front if I use the left over fabrics. I have been looking for an opportunity to play with an idea from this excellent book and I think this is the chance. I'll keep you posted. Another work in progress is my English Paper Piecing project. I think I need one or two more groups and then they will be appliquéd to the low volume top, something like the set up in next picture. I have been eyeing other EPP projects, it seems that I have become rather enchanted. So although I wanted to machine stitch the EPP onto that top, armed with my new applique experience, I am thinking that it will work so much better if I do it by hand as there will be no stabilizer in place. I would love any advice on that. 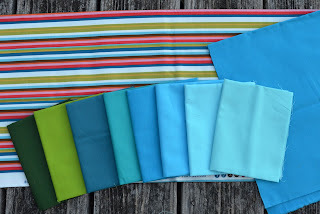 That beautiful bundle of fabrics arrived a while ago from my friend Cindy at Fluffy Sheep Quilting. She still delivers faster from Ireland to me in Canada than the US shops. I am going to make a tutorial of a something for her September newsletter. It is my current WIP, that and making another secret pillow for the Modern Quilted Pillow Swap and some bee blocks. A fair bit to do before the end of this month, but it is all so fun. I almost forgot, I joined Krista from Poppyprint's Proverbial Quilt-A-Long. She has promised a leisurely pace which is what I need. I still have to pick some words but I have the pattern in hand, delivered quickly from Flare Fabrics which is a Canadian shop. Krista's wonderful quilt is here, go and look and you will might be joining the QAL too. Just saying. By the way, if you have not yet entered to win a copy of the Mod Pop pattern by Julie from Distant Pickles, click HERE as there is still time. I am going to link to both WIP Wednesday at Freshly Pieced and the Needle and Thread Network, buttons for both are on the right. I have missed linking for the summer - my progress has not been available to report remotely near a Wednesday. Do check out everyone else's projects there too, they are always inspiring. wow, this quilt has been a bit of a journey, hasn't it?! Your choice of fabrics really makes it. I'll be interested to see how you quilt it. And fun if you go with the Quilting Modern idea for the back! I so need to get working through the techniques in the book! Wow Leanne, love the Windmills and Trees quilt! 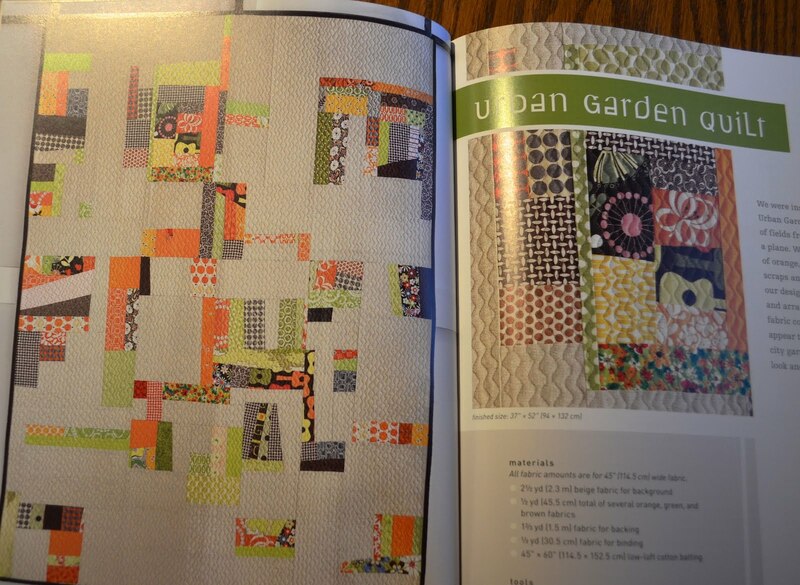 I’m curious to see your backing version of the Urban Garden quilt! Love that book! both versions of your low volume applique quilts are so beautiful and I couldn't be happier that you are joining the Proverbial quiltalong! Really, it's sew as you go - no contests, no voting, just enjoy the process and make a meaningful quilt. Of course there will be prizes along the way, but all you have to do is play! Super choice of colours for your applique trees, I enjoy using a machine blanket stitch too - not sure how big the tree tops are but do you know the trick of cutting away the centre of your fusible web on big areas before sticking to your fabric? It makes the finished piece less stiff, which sometimes happens with a big design. You probably know this. I would love to see your EPP rings on a black background. the trees look fantastic - I love the prints you used. Really really beautiful! I love both versions of the quilt. 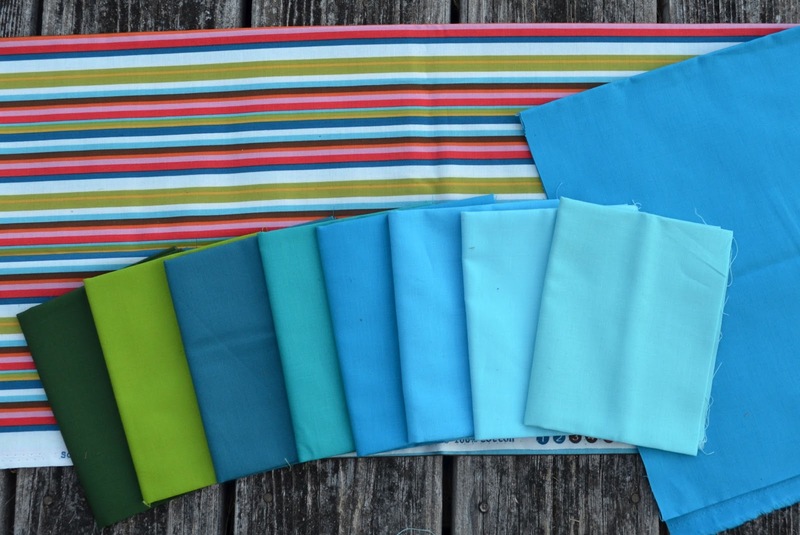 It's really nice to see that the same pattern can look so different depending on the fabrics you pick. I really like the way the tree quilt turned out....I can't believe all the sewing you're doing. If I hadnt met you I'd think there are two of you... Phenomenal amount of work as usual, and as usual I love it all!! I love the tree quilt. greys and green work so well together and the outcome is a cool and fresh quilt. You are a workhorse !! Love the tree quilt, and the stitches you used to applique. The trees look great. I think that back would be wonderful too. Love the 'low volume' quilt!!!! It gave me some ideas, to try out! Thanks for sharing! I love your windmills and trees top and I can't wait to see more of your low volume/EPP quilt! Oh those trees are brilliant! Those colours pop beautifully against the greys. The EPP one will look fab too - those little wheels of colour are lovely! Love the tree quilt and the rings are really cute. Both trys are great. I'm hard pressed to chose one over the other. You have sure nailed that applique stitch. Both of your windmills and trees are irresistible to me, Leanne!Love Kaffe! Your tree quilt colors are so bright and wild--love it to pieces! Enjoy the blue fabric you received. Love the tree quilt! Great colours! I think you did a fabulous job on the windmills and trees quilt. It is gorgeous! I loved seeing Lynne's, and now that I've seen yours I just must make this!! I love your tree quilt....I love the fabrics you have used. Wonderful:) Your other projects are very interesting too and look forward to visiting again. Wow! Your trees look simply amazing!! Well done! My god woman. You are good. REALLY fecking good. The trees are awesome but y'know I think the PP'd beach one just edges it for me. LOVE that background. Love. I really, really love this tree quilt.Can't wait to see it quilted. Really love the tree quilt!!!! Oh my gosh, your tree quilt is amazing. I love it! LOVE IT! Love tge B&W with colour? It looks VERY smart! I still haven't come to terms with applique, but you have cracked it here. It looks great and I like the effect of the stitches. I just love your tree quilt, and those interlocking circles will look fantastic, too. There is a trick for appliqué: a piece of paper under the bottom fabric prevents puckering of the background, but I guess you know about that already, as your work looks flawless. I am leafing (pun) through your most recent posts, since I've missed a few since school started (and slammed me against that proverbial wall). I'm loving this tree quilt, and your stitching is nigh unto perfection, if I do say so myself. You've been quite productive lately--such inspiration ought to motivate me to get going! Love the EEP circles. Where did you get the pattern pieces for it?